Whether you’re looking for a katana for display purposes or a functional one, you’ll likely want to get a quality sword stand as well to go with it. A beautiful weapon like the katana shouldn’t be hidden away in a closet, so if you want to make sure it gets the spotlight it deserves do consider getting a katana stand — most are very cheap, so no matter what your budget is you’ll find something you like. A display stand like this can easily be mounted on a wall and is a beautiful way to get some attention to your sword collection. 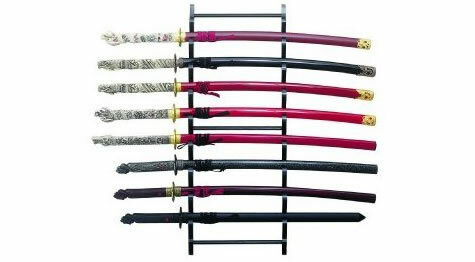 If you’re on the looking for any kind of samurai sword stand, the selection below is a good start.